5a: Lancer slashes vertically. Hits mid. 5b: Lancer stabs forwards. Hits mid. 5c: Lancer takes a step and swings diagonally. Hits mid. 2a: Lancer performs a sliding kick. Hits low. 2b: Lancer crouches and stabs high. Hits mid. 2c: Lancer does a low sweep. Has a long reach. Hits low. 6c: Lancer does a step forward swings in an upward crescent. Launcher. Hits mid. j.a: Lancer stabs 45º downwards. Hits high. j.b: Lancer stabs straight ahead. Hits high. j.c: Lancer swings his spear in a downward arc. Does not hit directly below. Hits high. 236a/b/c: Lancer thrusts rapidly with Gáe Bolg. a version = Lancer thrusts forward, 3 hits. b version = Lancer thrusts forward, 5 hits. c version = Lancer thrusts upwards at 45º. Followup: Mashing any attack button will extend the hits. The final hit will slam the opponent into the ground. j.236a/b/c: Lancer lunges with his spear. All of these can be done twice in the air in succession before landing. Hits high. a version = Lunges diagonally upward. b version = Lunges forward. Excellent pressure move when TKed. c version = Lunges diagonally downward. 214a/b/c: Lancer dashes fowards. Attack determines distance. The dash can be interrupted at any time with any of the followups. a version = Lancer dashes with a short range. b version = Lancer dashes with midscreen range. c version = Lancer dashes with fullscreen range. a = Lancer kicks the opponent upwards. Launcher. 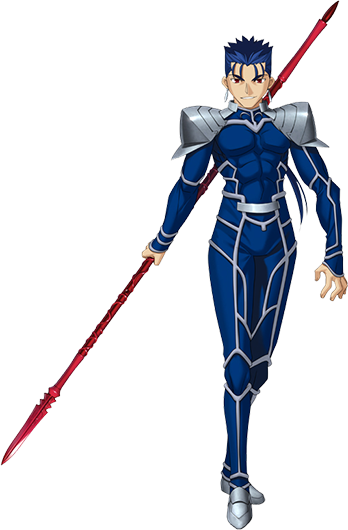 b = Lancer stabs Gáe Bolg into the ground and kicks the opponent upwards. Launcher. Not jump cancelable. c = Lancer stabs the opponent. d = Lancer stops in place. 623a/b/c: Lancer spins Gáe Bolg above his head. b version = A spinning uppercut with a horizontal finish with knockback. c version = A spinning uppercut that ends with a ground slam. Requires meter. 236236a: Gáe Bolg: The Spear of Impaling Barbed Death. Hits low. Despite what you may expect, it's not unblockable at any range. Requires 200% meter. 2700 damage, 1350 scaled. j.236236a: Gáe Bolg: The Spear of Impaling Barbed Death - Lancer lunges diagonally upward at the enemy. Requires 200% meter. 3000 damage, 1500 scaled. j.236236b: Gáe Bolg: The Spear of Striking Death Flight - Lancer hurls his spear at the opponent at a 45º angle. 2000 damage, 1000 scaled. 236236c: Lancer kicks the opponent into the air, then jumps and throws Gáe Bolg through them with all his might. 4000 damage. Basic j.b loop BnB. 4163 damage. Alternative j.b loop. Deals more damage but a bit harder to execute. 4363/4388 damage. Midscreen alternative BnB. Deals ~5000 damage. Requires strict timing in the 2147c~b loop. Combo finisher with Spear Toss. Requires around 1/2 meter to work. Double Spear Toss combo. Requires 100% mana before first RC. Spear toss combo. Deals 10000+ damage. - Please note that most combos either require or are easier to execute if you do a high jump instead of normal jumps when you have to jump. For high jumps, the input is 28 or 29 instead of just 8 or 9. - For Throws, basically do a throw > 6c then combo of choice. - Berserker can escape after the "(…) > 6239c > (RC) > 2c > 6c" in combos. In order to avoid that, do "(…) > 6239c > (RC) > 6c > (…)". It's also good to do that if you're having problems to land those against characters like Archer and Kirei. - If you are running low on meter before the "(…) > 6239c > (RC)" in combos, you can always change 6239c to 6239b and RC before the last hit and continue with "2b > 2c > 6c > (…)"
- While the 214c~b loop BnB is very hard to do, it is quite useful to at least master the timing of the first "2147c~b" used in the combo. With that, you can change sides during any combo, in example, let's say you're cornered and manages to land a 2c, you can follow-up with "6c > j.b > 2c > 6c > 2147c~b > (…)" and force your opponent to the corner you were. It's also useful for people who have problems doing inputs in certain directions.